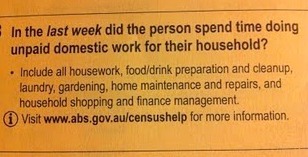 It's census night here in Australia. and I think she eventually sort of got it when we got to the Mary and Joseph story! Even though she is not entirely sure what it's all about she asked plenty of questions. "Do we have to include the cats?" "We can't have 'friend' to play otherwise it will mess up the census"
"Oh no, Dad is away...(wobbly bottom lip) he won't get any services if he's not on the census!" but allow me to just take a moment to comment on the question about ancestry. It asks - "What is the person's ancestry?" and then gives 7 options with a 'other' box at the end. How come "English', 'Irish' and 'Scottish' get a box...and no 'Welsh'? Hmmph! I also had a little chuckle with this box - I ran out of counting fingers!! Anyhow, I completed my census online and it was super quick and easy. When I pressed "submit" it made me recall that earlier conversation. No donkey to get to the census city...not even a pencil was needed! ipad on lap, completing it? What is going on in some parts of England at the moment? Riots and looting on the streets of London and some of the major cities? I hope it settles quickly and safely. goddess" : ) : ) !! Byron was unimpressed too! He made sure to check "other" and put Wales in the box. Ancestry for the kids was a tricky one. I'm Irish. Byron Welsh. Kids born in England and now Australian citizens. Technically they could choose irish, welsh and English but only two choices allowed...! I was filling out the form so I got the final say! The Australian Government need to revise the document to include Wales! I just read in the paper that 670,000 people forget to hit submit! My Grandfather is Welsh so I totally agree with you. We need to start a campaign to include Wales! I'm hosting a give away at my blog so please stop by if you have a moment!